Gastops Ltd., a global leader in condition assessment products and specialized technical and engineering services announced today the addition of ChipCHECK to their product line alongside the launch of their new corporate brand. We wanted to create a product to provide equipment maintainers with immediate, on-site information to empower them to make the right GO/NO-GO decision quickly and reliably, every time. 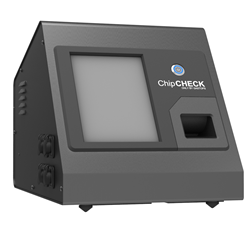 ChipCHECK sets the new standard for on-site condition assessment performed by equipment maintainers. This innovative product analyzes wear debris collected on engine and transmission oil system chip detectors to provide immediate on-site GO/NO-GO maintenance decision support enabling operators to maximize aircraft dispatch availability and eliminate delays. “We wanted to create a product to provide equipment maintainers with immediate, on-site information to empower them to make the right GO/NO-GO decision quickly and reliably, every time," says Dave Muir, CEO of Gastops. “We feel we have achieved this with ChipCHECK”. Gastops’ new brand was designed to represent the industries Gastops serves – aviation, energy, marine and industrial, and Gastops’ commitment to keeping high-valued equipment operating. The new logo will be visible on all marketing material and online on the newly launched corporate website. Founded in 1979, Gastops is recognized worldwide for its innovative contributions to the maintenance, productivity, and safety of critical equipment used in aviation, energy, marine, rail, and mining industries. Gastops products and services have added value throughout the life cycle of complex critical equipment from the design stage through to in-service operations and support. Gastops logo - Before and AfterGastops’ new brand was designed to represent the industries Gastops serves – aviation, energy, marine and industrial, and Gastops’ commitment to keeping high-valued equipment operating.